The winner of our Facebook Free App Poll is Signature- Secret Notes & Photos – an app for hiding your private notes and photos on your iPhone! We all have things that we’d like to keep private, and with plenty of apps letting you store information on your phone, just few of them ensure the privacy of your information. This means that once the passcode is bypassed, everyone can access the data in your phone. 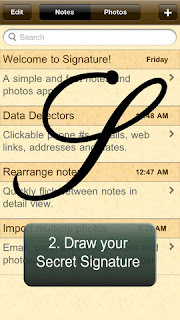 However, Signature allows you to secure your private data by drawing your secret signature on the screen. With no password prompts or buttons that would give away the existence of your secret area available, the lock is impossible to avoid. This ensures your most private information remains safely locked away from prying eyes, including banking information, ID numbers, intimate photos and passwords staying hidden for others. • Signature matching based on the shape, direction and relative speed of the signature for better security. In contrast, the size and angle of the signature can be varied. • Multi-Segmented Signature. You can lift your finger off the screen between gestures to create a string of small signatures that are combined into the entire signature. • User customizable matching accuracy for the signature. • Enter your secret area by drawing your secret signature anywhere in the public area. • Search and rearrange notes. Quickly flick between notes. Detects phone numbers, web links, email addresses, physical addresses and dates. • Import multiple photos from your library or take photos with the camera. • Option to view the finger trail as an overlay on the entire app and many more! 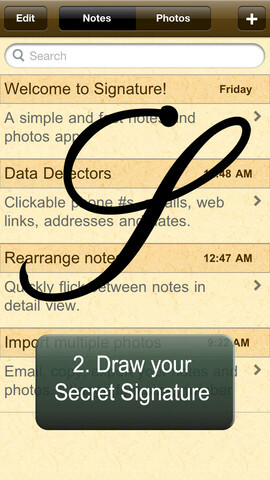 Signature- Secret Notes & Photos is available for the iPhone, iPod Touch in the Apple App Store for FREE! So get the app and achieve the top level of secrecy!